We have a wide range of skills talents and abilities of which we are not aware. Reading backwards is one. Most people can do it and not even realise that it is happening. Take Arabic (Oh go on! After all this is about Oman). I will assume you know that Arabic is written right to left (for those who did not know that read the following sentence. ‘Arabic is written right to left’) OK, so that is everyone up to speed on the basic premise. Digression: Some people write OK as okay, which is OK. Okay? The numbers 1 and 9 are the same in both written languages. Whereas a zero is a dot like this (.) and 5 is what we would call a nought or zero (0). The number 4 looks like a reversed 3 and worse still is the number 6 which looks like a western 7 (see pic above). The numbers 2 and 3 are quite easy to remember as they are like sevens but with either two or three ‘points’ on top (so look for the points). The 7 and 8 are Vs, with 7 looking like a regular V and 8 looking like an upside down V which is best depicted on a computer keyboard with the ‘carat’ symbol (^). To tell which is which it is only necessary to remember which way up they go. Think ‘V’ and ‘upside down V’ and you have them in their correct numerical order – namely 7 (V) and 8 (^). 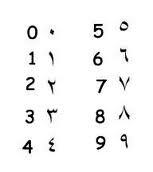 In Arabic, while letters are written from right to left, numbers are written left to right, which is backwards to them but the same as we are used to in the west. This is the number 19. It is the same in Arabic: 19. This is in effect reading the letters backwards (9 first then the 1). And we are even smarter than we thought as we do not say nine-one, but because the 1 is actually a 10, we add them together without thinking and it becomes nineteen**. And we do the same with the other 'teen-numbers'. We do this instinctively***. I doubt many of us have thought about it as reading backwards but that is what it is. So, clever you! You have a numerical skill you may not have recognised. But it only works with the 'teen' numbers. Twenty-seven is written 27. One hundred and eighty is written 180 (pronouciation is matter of personal choice) and so on. So why do Arabic writers write all their numbers left to right when they write their letter the other way? Damned if I know – but I am working on it and when I find out YOU will be the next to know. If you know tell me and I will pass it on. * An expression used in any contest where the correct answer would win a cigar. This example looks like 179 but in Arabic is actually 169, which is close but not close enough to win the cigar. ** Of course you could argue that we see the two numbers 1 and 9 as a single shape which we know to be the number 19 but that spoils the fun of being smarter than we thought, so I won't dwell on it. *** OK, we had it drummed into us at school, and maybe the word should be 'habitually'.